A crate can become a safe, fun place for your yorkie. Crate training your Yorkshire terrier allows you to keep her out of trouble when you're unable to supervise her. Known as high-energy and independent terriers, yorkies are notorious for entertaining themselves in ways their people may not approve. By using a crate, you can provide your pup with structure and security. Choose a crate that's small enough for your tiny terrier. While many people make the mistake of selecting a crate that's too large, your yorkie will feel more secure and will be happier in a crate that provides a cozy, den-line feel. Your pup's crate should be large enough for her to lay down, stand up without having to duck and to turn around. If you choose a wire crate, pick one that will fit your yorkie as an adult and place a divider panel in it while your puppy is growing. Abstain from putting any bedding, stuffed toys or blankets in your dog's crate until she is fully crate trained or until you know she won't destroy the items. Not only is replacing destroyed bedding and toys costly, filling, fluff or fibers from the bedding or toys can get caught in your dog's digestive system and require surgical removal. Feed your pooch in her crate. By linking the crate with mealtimes, your dog will form a positive association quickly with her kennel. You'll notice her running to her crate when you begin preparing food within a matter of days. Toss a treat into your pup's kennel at random points throughout the day and cheerfully say, "kennel up." Close the door and toss a treat into the kennel every few minutes while your dog is being quiet. Never open the door if your yorkie is barking, whining or whimpering. Prepare Kong or other treat-dispensing toys for your yorkie to play with while she's crated. As highly intelligent terriers, yorkies welcome a good challenge. Other crate toy options include raw bones, compressed rawhide or bully sticks. 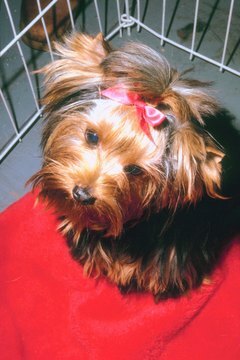 Lengthen the amount of time your yorkie spends in her kennel gradually. A good rule of thumb regarding how much time your dog can spend crated is "one hour per every month of age." However, your pup should spend only a maximum of 6 to 8 hours in her kennel a day and then only rarely. Keep your dog's kennel a positive place. Do not use it for punishments. How Big of a Crate Does a Chihuahua Need?